Kick it at The Rockin' Horse Saloon and Grill, just outside of Chicago, with a full line-up of entertainment and specials. Try our Rockin' Horse Deep Fried Philly! It's our signature spin- all your favorite Philly fixings, rolled up in a wrap, and fried to crispy perfection. Come in for a drink and give our Deep Fried Philly a shot today! Start your week off right with an open mic where you can take the stage at The Rockin’ Horse Saloon & Grill in Oak Forest! This is your chance to meet and greet with industry professionals while spreading your talent through the South Suburbs of Chicago. So much fun on the most dreaded day of the week. Add some soul to your step with FREE admission to Rockin' Horse Saloon & Grill in Oak Forest every Tuesday starting October 16th. 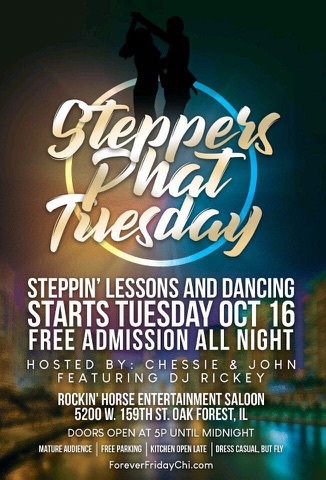 Steppin’ lessons and dancing hosted by Chessie & John featuring DJ Rickey. A sure fire way to impress your lady or meet one here! 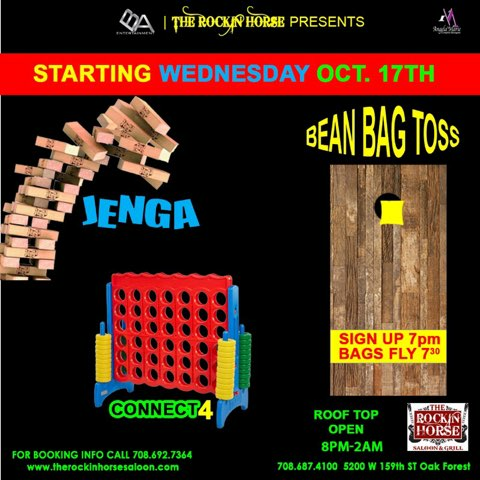 Join us every #humpday for our Rockin' Horse Bags Tournament. Be on site by 7pm to sign up and our first team flys at 7:30pm. Not down with bags? We’ve got classic games like Jenga and Connect 4 too. We’ll keep you entertained while you get through your week. Sing your favorite jams on stage at The Rockin' Horse Saloon & Grill, just outside of Chicago in Oak Forest. You don't have to be a pro, we'll drink enough to make sure you sound good. We know you are THIRSTY by Friday! #TGIF with a jumbo sized Fishbowl drink at The Rockin' Horse Saloon & Grill in Oak Forest! Share one with your BFF or sip on your own, we won't judge! It's Friday. You want to get out and forget about the world. Let Rockin' Fridays take you away! With 3 rooms of hip hop and Chicago House music pumping 'till 3am, there's no other place to party than The Rockin' Horse Saloon & Grill in Oak Forest, just south of Chicago. Just steps from the Oak Forest Metra stop, nobody even has to drive! Get out on the town with the hottest events and nightlife every Friday & Saturday night at The Rockin' Horse Saloon & Grill, 5200 W 159th St. Oak Forest, in the South Suburbs of Chicago. Check the EVENTS LINE UP to find fresh R&B artists and events you won’t want to miss! She's a feisty one, goes great with football, will fill your belly, and give you a buzz. And she's on special all day until last call every Sunday. Give it a go with South Side Mary, The Rockin' Horse Saloon & Grill's signature bloody Mary. People say she's the best bloody Mary in the South Suburbs of Chicago. Or if you're in an eggs and bacon kind of mood, go for the Breakfast Mary. For the seafood lovers- the Marina Mary complete with crab legs and shrimp! Sip a cocktail and shop the latest trends at The Rockin' Horse Saloon & Grill every 3rd Sunday. Our vendor showcase is from 2pm-6pm and the party keeps going till we close! To book your vendor table or party, call 708. 743.8451. Nothing but respect for first responders of the South Suburbs. Show us your badge and we'll knock 10% off your bill. Its a discount you deserve. All day. Every day. Until last call. Police. Fire. EMT. Military. Veterans.